There are 11 Assisted Living Facilities in the Rome area, with 6 in Rome and 5 nearby. The average cost of assisted living in Rome is $2,490 per month. This is lower than the national median of $3,346. To help you with your search, browse the 39 reviews below for assisted living facilities in Rome. On average, consumers rate assisted living in Rome 4.3 out of 5 stars. Better rated regions include Cartersville with an average rating of 4.5 out of 5 stars. Caring.com has helped 5 families in Rome find high-quality senior care. To speak with one of our Family Advisors about assisted living options and costs in Rome, call (855) 863-8283. There are 11 assisted living facilities in the Rome area. Six of these lie within the city itself with another five in close proximity. These are all governed by the Georgia Department of Community Health. For a community to remain in good standing under the department's guidelines it must make provisions for or offer assistance with essential daily living activities (EDLAs). EDLAs are defined by the state as (but not limited to) eating, bathing, toileting, grooming and dressing. These facilities must provide care for 25 or more patients and have a certified medication aide to oversee the dispensing of medications. The costs of assisted living facilities in Rome are $4,225, above the national average of $3,750. The cost of living in Rome is 13.6 percent below the national average, likely due to the low housing costs that the area enjoys. The costs of the basic necessities for the majority of assisted living facility residents would not be affected, and there would be little savings realized. Rome is unusual for a small southern town of only 36,000 residents because it has a city managed bus line. The buses operate on set routes and seniors receive a 50 percent discount on fares. However, the buses only operate from 5:40 am to 6:30 pm, Monday through Friday. Curb-to-curb service is available for the handicapped and elderly but a special application must be submitted to the transit authority for approval. The city also has two taxis that operate on an on-call basis. Rome has a higher crime rate than 92 percent of the United States with one in every 168 residents falling victim annually. Violent crimes are relatively rare in the city but an extremely high property crime rate makes it a town where you wouldn't want to leave doors unlocked or walk the streets alone at night. With summer highs averaging just below 90 degrees and winter lows just a bit below freezing, Rome has a very comfortable climate the majority of the year. For those seniors who are sensitive to moist weather, it is not ideal as the city is prone to being humid and experiencing severe thunderstorms. Rome hosts several cultural events throughout the year such as the Annual Shakespeare Festival but the availability of cultural activities in the city is limited. The Rome area is home to world-class medical facilities, including Floyd Medical Center and Kindred Hospital, in the event of medical emergencies or illness. Assisted Living costs in Rome start around $2,490 per month on average, while the nationwide average cost of assisted living is $4,000 per month, according to the latest figures from Genworth’s Cost of Care Survey. It’s important to note that assisted living rates in Rome and the surrounding suburbs can vary widely based on factors such as location, the level of care needed, apartment size and the types of amenities offered at each community. 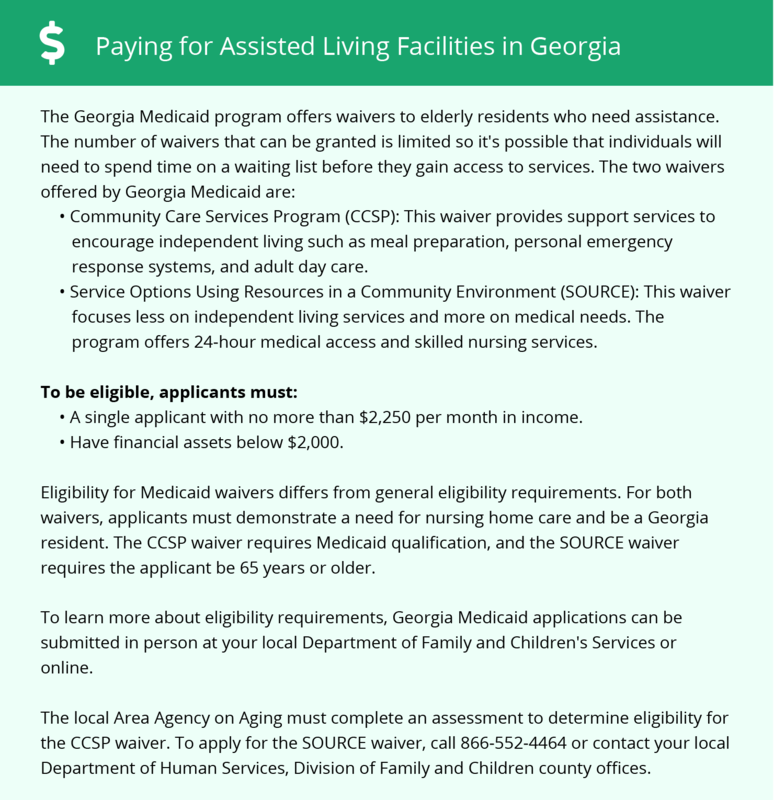 Eligible seniors can apply for financial aid to help pay for assisted living facilities through two state-operated Medicaid waiver programs both of which are subject to availability: Service Options Using Resources in a Community Environment (SOURCE) and the Community Care Service Program (CCSP). Rome and the surrounding area are home to numerous government agencies and non-profit organizations offering help for seniors searching for or currently residing in an assisted living community. These organizations can also provide assistance in a number of other eldercare services such as geriatric care management, elder law advice, estate planning, finding home care and health and wellness programs. To see a list of free assisted living resources in Rome, please visit our Assisted Living in Georgia page. Rome-area assisted living communities must adhere to the comprehensive set of state laws and regulations that all assisted living communities in Georgia are required to follow. Visit our Assisted Living in Georgia page for more information about these laws.